Photos: Hilary Duff Rocks Leopard Print! The ‘Younger’ actress Hilary Duff was seen in Los Angeles, California. She was with her son Luca rocking a Leopard print jacket while she was out and about today February 23, 2015. Demi Lovato Is Gonna Be The Lead In Animated Film! 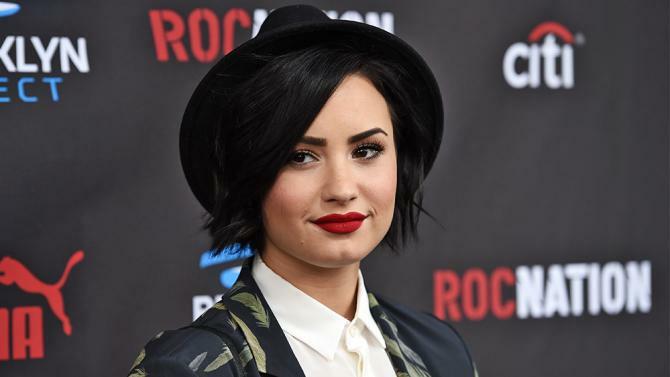 It was recently announced that singer and actress Demi Lovato​ will be the female lead and music score producer in the upcoming animated comedy film “Charming”! The film is taking a spin on classic tales of Cinderella, Snow White and Sleeping Beauty where all the women find out they’re engaged to the same Prince Charming! Can’t wait to see this new animated film that’s for sure! Keep checking back with TI for more updates on this awesomeness!! Photos: Hilary Duff Is All Smiles in West Hollywood! “Younger” star Hilary Duff is all smiles as she steps out on February 20, 2015 in West Hollywood, California, though she is likely reeling from a recently released story. Photos: Hilary Duff Shops for Groceries! Singer and actress Hilary Duff stops by Ralph’s in Studio City, California to stock up on groceries with her son Luca on February 19, 2015. Hilary couldn’t help but laugh at her son who kept picking his nose in front of the photographers! Photos: Kirsten Dunst Out For Lunch In West Hollywood! ‘Midnight Special’ actress Kirsten Dunst goes to lunch with her mother Inez in West Hollywood, California on February 18, 2015. Kirsten wore a short navy blue skirt to show off her pasty white legs and a peacoat incase she got cold. Photos: Kristen Stewart Arrives at LAX! ‘Twilight’ actress Kristen Stewart arrived on a flight at LAX airport in Los Angeles, California on February 18, 2015. Photos: Taylor Swift Steps Out In NYC! Singer Taylor Swift is seen leaving her apartment in New York City, New York on February 17, 2015. Taylor was one of the many celebrities who recently attended the SNL 40th Anniversary Gala.